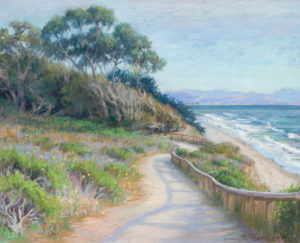 Ann Thiermann’s series of pastel and acrylic paintings invite the viewer to visually linger over the flora and fauna along the pathways of our extraordinarily diverse parks in Santa Cruz County. From river to sea, chaparral to marsh, and rustic to urban, creatures both wild and domestic, marine and terrestrial, historic and contemporary inhabit her park pathways in a variety of seasonal and weather conditions. Explore these iconic Santa Cruz views and discover them for yourself in our abundant parks and open spaces. Meet the Artist: First Friday, December 7th, 6-8pm. Free to the public. Artist Workshop: December 15th, 9:15-11:30am. Learn more HERE. Ann Elizabeth Thiermann, MFA, is inspired by living, hiking and painting in beautiful Santa Cruz County. Her creativity is fueled by her artistic family, Sylvie, the studio cat, her folk dancing friends, and teaching and leading art trips abroad. In addition to painting landscapes and murals, daily joy comes from swimming, camping and visiting the farmer’s market and working in her garden. Movement in her art is reinforced by her time playing organ, piano and harpsichord as a church musician.